UCF today was awarded a $55 million NASA grant to build and launch into space an instrument the size of a microwave oven that will provide unprecedented imaging of the Earth’s upper atmosphere. The award is the largest single grant in UCF’s history, and UCF will become the first Florida university to lead a NASA mission. The information collected by the Global-scale Observations of the Limb and Disk (GOLD) mission will have a direct impact on understanding space weather – such as solar wind – and its impact on communication and navigation satellites, which we’ve come to rely on for everything from television programming to cell phone coverage and GPS in our vehicles. The information may also lead to advances in directing airline traffic in a safer manner by providing a greater understanding of how space elements impact communication signals. The project is a collaboration between UCF, the Laboratory for Atmospheric and Space Physics (LASP) at the University of Colorado, and the commercial satellite company SES Government Solutions. UCF will oversee the project and build the data center that will collect, process and distribute the data for the mission. LASP will build the compact instrument, which will operate in a geostationary orbit, and SES is scheduled to launch it on one of its communication satellites in 2017. GOLD’s collaborative approach may lead the way for similar projects at UCF and other universities nationwide. 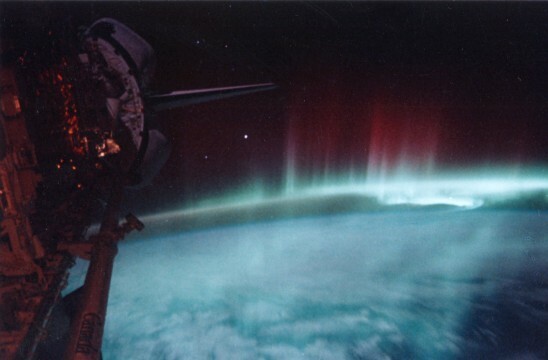 The scientific goals of the GOLD mission are to determine how geomagnetic storms alter the temperature and composition of Earth’s atmosphere; analyze the global response of the thermosphere to extreme ultraviolet variability; investigate the significance of atmospheric waves and tides propagating below the thermosphere; and resolve how the structure of the equatorial ionosphere influences the formation and evolution of plasma-density irregularities. The thermosphere is the part of the atmosphere that begins about 50 miles above the earth’s surface and extends to outer space. Given the sophistication of the measurements needed, Eastes and his team turned to LASP to build the GOLD instrumentation. The lab has an international reputation for excellence and has been around since before NASA was formed. Scientists at LASP are eager to start. The five-year project will begin immediately. Once the design is finished and checked, rechecked and rechecked again, LASP will begin construction. After launch in 2017 the instruments will provide data to the team, and other scientists throughout the world, for at least two years. Eastes says the instruments will likely continue to function for an additional three to five years. Other members of the GOLD team that will be supporting the mission include the National Center for Atmospheric Research, the University of California at Berkeley, Computational Physics Inc. and the National Oceanic and Atmospheric Administration. This money would be great if it went towards my tuition instead of this...just saying.